Akhenaten, the pharaoh of the eighteenth Dynasty of Egypt, was the second son of Amenhotep III (r. 1391–54 b.c.e.) and Tiy (fl. 1385 b.c.e.). His reign ushered a rev- olutionary period in ancient Egyptian history. Nefertiti was his beautiful and powerful queen. He was not the favored child of family and was excluded from public events at the time of his father Amenhotep III. Akhenaten ruled with his father in coregency for a brief period. He was crowned at the temple of the god Amun, in Karnak, as Amenhotep IV. From his fifth regnal year, he changed his name to Akhenaten (Servant of the Aten). His queen was renamed as Nefer-Nefru-Aten (Beautiful Is the Beauty of Aten). The pharaoh initiated far-reaching changes in the field of religion. He did away with 2,000 years of reli- gious history of Egypt. In his monotheism, only Aten, the god of the solar disk, was to be worshipped. The meaning of the changed names for himself and his queen was in relation to Aten. Even the new capital that he constructed was given the name Akhetaton (Horizon of Aten). Making Aten the “sole god” curbed the increasing power of the priesthood. Earlier Egyptians worshipped a number of gods represented in animal or human form. Particular towns had their own gods. 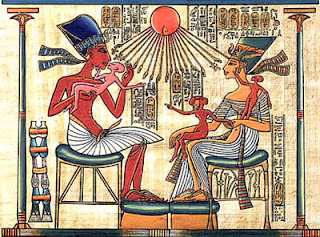 The sun god received the new name Aten, the ancient name of the physical Sun. The king was the link between god and the com- mon people. Akhenaten was the leader taking his fol- lowers to a new place, where royal tombs, temples, palaces, statutes of the pharaoh, and buildings were built. In the center of the capital city, a sprawling road was built. Designed for chariot processions, it was one of the widest roads in ancient times. The capital city Akhetaton on the desert was surrounded by cliffs on three sides and to west by the river Nile. The tombs of the royal family were constructed on the valley leading toward the desert. Near the Nile, a gigantic temple for Aten was built. The wealthy lived in spacious hous- es enclosed by high walls. Others resided in houses built between the walled structures of the rich. About 10,000 people lived in the capital city of Akhetaton during Akhenaten’s reign. Artwork created during the reign of Akhenaten was different from thousands of years of Egyptian artistic tra- dition by adopting realism. Akhenaten, possibly suffering from a genetic disorder known as Marfan’s syndrome, had a long head, a potbelly, a short torso, and promi- nent collarbones. Representations of the pharaoh did not follow the age-old tradition of a handsome man with a good physique. The sculptor portrayed what he saw in reality, presumably at the direction of Akhenaten. The background of the exquisitely beautiful and powerful queen Nefertiti is unclear. Some believe that Queen Tiy was her mother. According to others, she was the daughter of the vizier Ay, who was a brother of Queen Tiy. Ay occasionally called himself “god’s father” suggesting that he was the father-in-law of Akhenaten. She carried much importance in her hus- band’s reign and pictures show her in the regalia of a king executing foreign prisoners by smiting them. According to some Egyptologists, she was a coregent with her husband from 1340 b.c.e. and instrumental in religious reforms. Some Egyptian scholars believe that in the same year she fell from royal favor or might have died. Nefertiti was probably buried in the capital city, but her body has never been found. Some researchers think that she ruled for a brief period after the death of Akhenaten. She had no sons, but future king Tutankhamun was her son-in-law. Known as the “first individual in human history,” the reign of Akhenaten forms an important period in Egyp- tian history. Despite his revolutionary changes, Egypt re- verted to earlier religious discourse after his death.